Iveri Buadze, a Senior Lieutenant in the Republic of Georgia armed forces, was leading a team of Georgian soldiers with his Marine advisors on Sept. 6, 2017, as they visually inspected vehicles prior to entering Bagram Air Field in Bagram, Afghanistan. A suicide bomber on a motorcycle in the line of vehicles detonated his explosives and Buadze sustained life-threatening injuries. According to Buadze’s neurosurgeon at LRMC, Army Maj. George Rymarczuk, Buadze arrived with multiple major injuries, including significant damage to his right leg and arm and penetrating trauma to his neck, chest and abdomen. The force of the explosion was so strong that surgeons in Bagram had to remove a portion of his skull to relieve pressure from swelling and bleeding. Buadze later lost his right eye and right leg from below the knee. 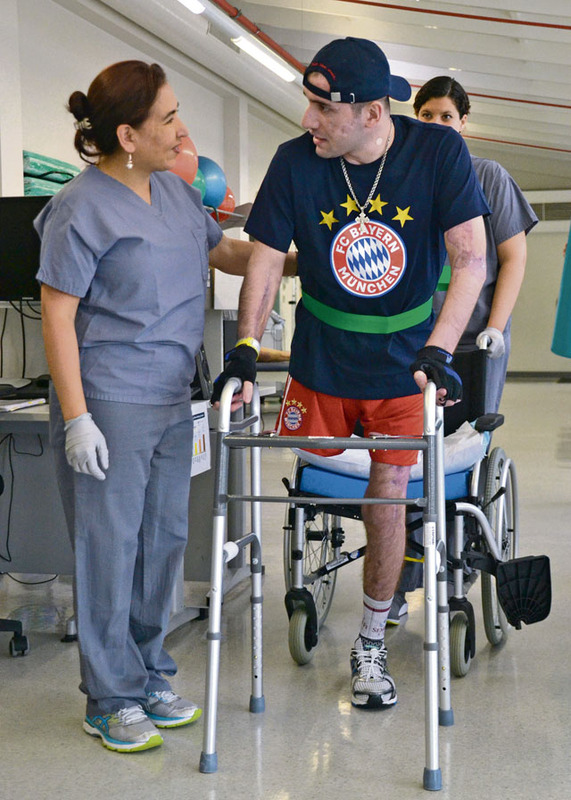 While he remained in a medical coma for two months, his body’s natural healing systems got to work and the LRMC medical team remained committed to Buadze’s recovery. Despite the coma, Buadze’s medical care would not be easy as he also had head trauma, a brain injury, multiple broken bones, infection in his wounds, liver failure, amputation, extreme blood loss and more. Even as the team fought for Buadze’s survival, they also prepared for the worst by discussing the most likely outcomes with the Georgian medical liaison and Buadze’s family in Georgia over phone calls and video chats. Buadze’s brother came to LRMC as quickly as he could. When he arrived, Amiran Buadze, an artillery platoon sergeant in the Georgian armed forces, stood at the foot of his brother’s bed and said a special prayer. Through an interpreter, Amiran Buadze shared that he was praying with his brother on Sept. 21, the day the Georgian Orthodox Church celebrates the birth of the Virgin Mary. “I asked Holy Maria for Iveri to get better,” said Amiran Buadze. While Amiran was praying at the foot of the bed, he noticed that his brother opened and closed his eye and moved his mouth slightly. “At LRMC, we really aren’t equipped here for long term care like that,” said Petra Wine, an intensive care registered nurse. Strategically located near Ramstein, LRMC is the largest American medical facility outside the United States and part of the hospital’s mission is to receive wounded, injured and ill U.S. service members, government employees and contractors serving in Europe, Africa and the Middle East, as well as patients from NATO Allied nations and partner countries like Georgia. With a 99 percent survival rate, the LRMC team has successfully treated and returned more than 15,000 troops back to forward combat theaters. The primary role of critical combat care at LRMC is to either treat and remedy the patient’s medical concerns and return them to their units, or stabilize and transfer them to the United States for further care. 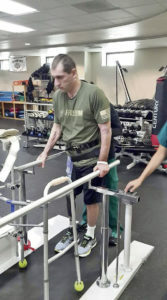 Most patients only stay at LRMC for two or three days; the long-term rehabilitation that Buadze required is not something that LRMC typically provides. “He would say to me, ’You are my commander, whatever you tell me to do, I’m ready,’” said Duluc. “Between the PT team and [Buadze’s] own strong will, now he is walking in less than six months,” said Wine as she watched Buadze take slow and steady steps down the ICU hallway. “I didn’t even think he would walk and look at him now!” said Duluc. LRMC’s team of Army and Air Force personnel also includes a small cohort of Navy, Marines Corps and special operations service members who make up the liaison office that transitions, orients and tracks wounded, ill and injured troops from forward operations. Because Buadze’s unit was working alongside the U.S. Marines in Afghanistan, the Marines at LRMC embraced him as their own. “Life is very strange. I want to say, never give up. Keep progressing and life is good. My bad health is not finished but I will continue to fight. I will show everyone that nothing is impossible,” said Buadze.